Click the button below to add the MINI LESSON Brick Stitch (materials fee) to your wish list. One or two Saturdays each month, we offer Mini-Lessons. These are 30 minute sessions where we introduce and explain a technique, go over the main choices you will need to make when implementing that technique, and then you get to practice it. We provide brief instruction, a handout, the materials and tools. Most are free, but some require a materials fee between $3.00 and $5.00. 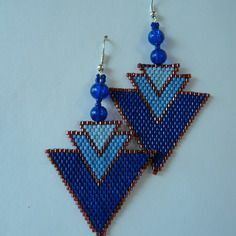 Brick Stitch is a lesser used bead weaving technique, most often associated with Native American jewelry. However, it is an especially versatile stitch and is a good substitute for the Peyote Stitch -- especially when you want to create shapes like leaves or butterflies. We learn how to start the brick stitch pattern, and how to start and finish each row. We discuss what projects work well with Brick Stitch, and what ones do not. We make a stitch sampler with a ladder-stitch foundation row, 3 squared off rows, and finished with an 8-row triangle shape.